My favorite little dude is back! Marcel the Shell with Shoes on, Three. I looooove French pop music, so I can’t wait to explore more of this list: 50 French Songs You Need to Hear Before You Die. Perfect: John Oliver Should Win a Pulitzer for This All-Dog SCOTUS Reenactment. Nailed it: Jim Carrey Brilliantly Mocks Matthew McConaughey’s Lincoln Ads on SNL. I could not adore him more: Daniel Radcliffe Rapping “Alphabet Aerobics” Is Proof That Magic Does Exist. Heh: Women Having a Terrible Time at Parties in Western Art History. Relevant: The Ultimate Guide to Pairing Wine with Halloween Candy. 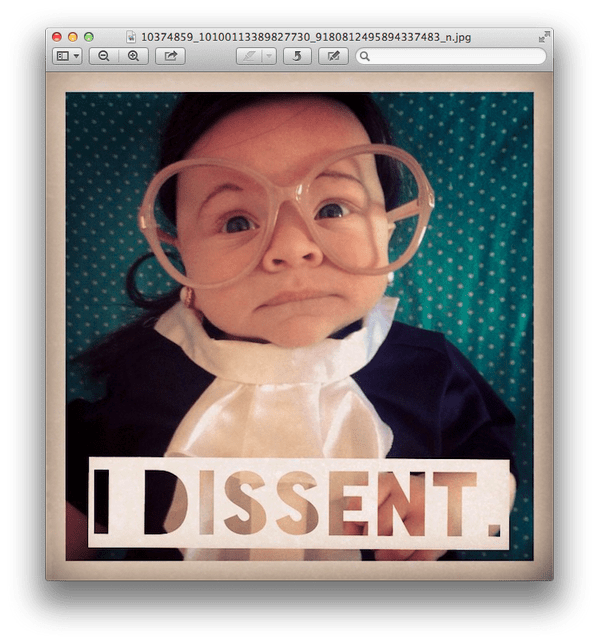 Best Costume Ever: Ruth Baby Ginsburg Officially Wins Halloween. “This is a very clever way to document everyone who attended the wedding. At least, the fun people”: Someone Attached a Camera to a Bottle of Whiskey at a Wedding and It Looks As Fun As It Sounds.